Heat oven to 400°F. In large saucepan or Dutch oven, cook ravioli to desired doneness as directed on package. Drain well; return to saucepan. Add spaghetti sauce, artichoke hearts, mushrooms and olives; stir gently to mix. Pour into ungreased 13x9-inch (3-quart) baking dish. Sprinkle with cheese. Bake at 400°F. 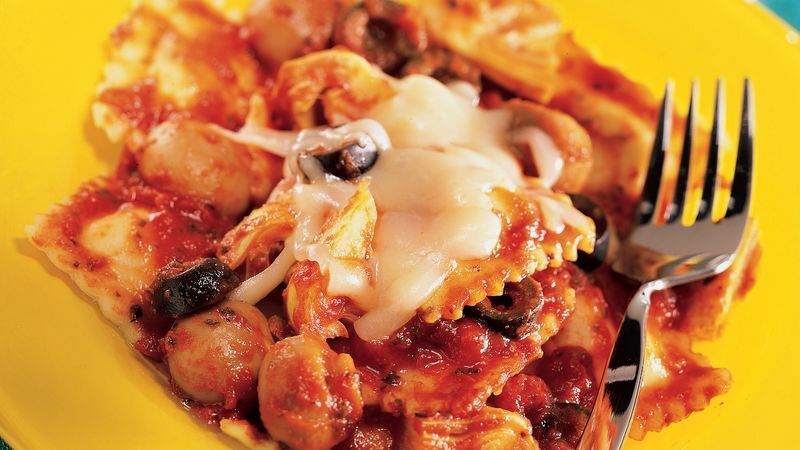 for 12 to 15 minutes or until casserole is bubbly and cheese is melted.